A smoky Victorian-era London street scene forms the backdrop to the reels in Dr Jekyll Goes Wild. Joining the lower value playing cards are a lamp, Big Ben, a quill, ink and paper, test tubes and the Dr Jekyll logo. 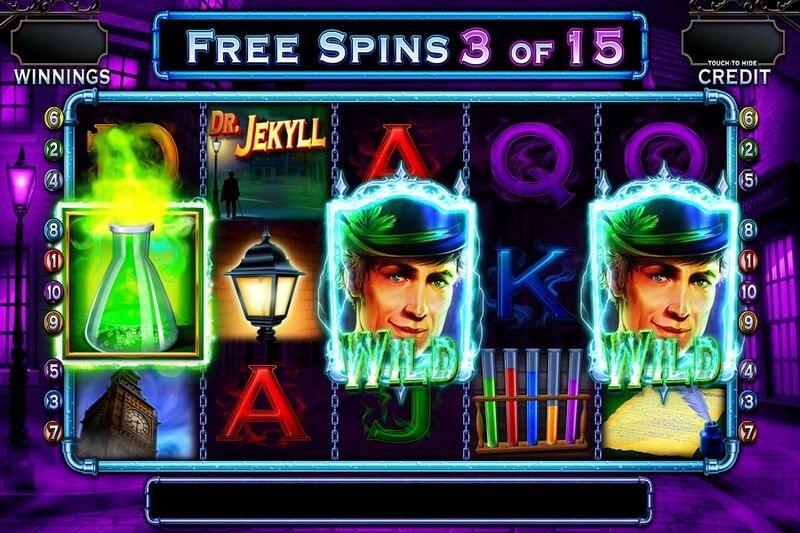 The dapper Dr Jekyll is the game’s wild – he replaces all other slots symbols apart from the scatter whenever he lands. Finding 3, 4 or 5 scatters anywhere on the reels on the same spin triggers the Free Spins feature and with it 12, 14 or 20 free spins. If you land a pair of wilds on the same free spin, extra free spins are added to your total. 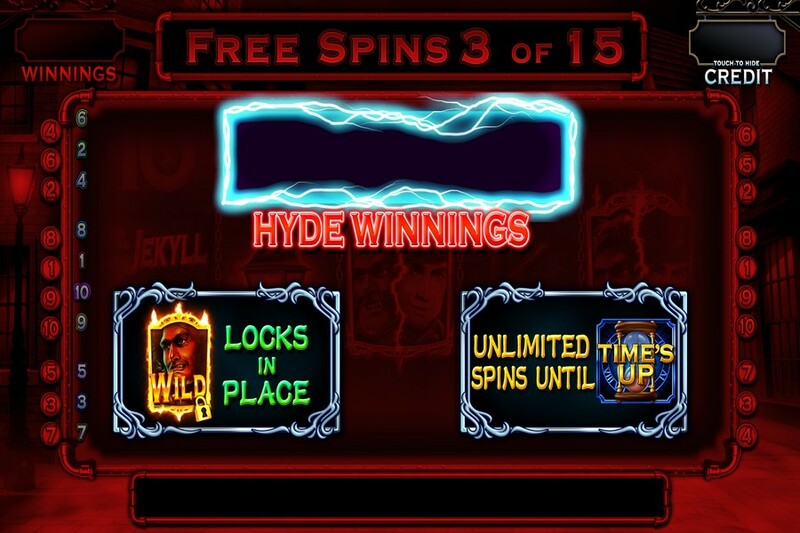 Better still is if you land a wild and a potion on the same free spin you’ll trigger the Hyde Spins feature. Any wilds that land during the Hyde Spins are locked in place for the duration. These continue until the sand timer lands on reel 5 – that will then spin and either allow you to continue or send you back to the Free Spins feature. You’ll then play out any extra free spins you have remaining. 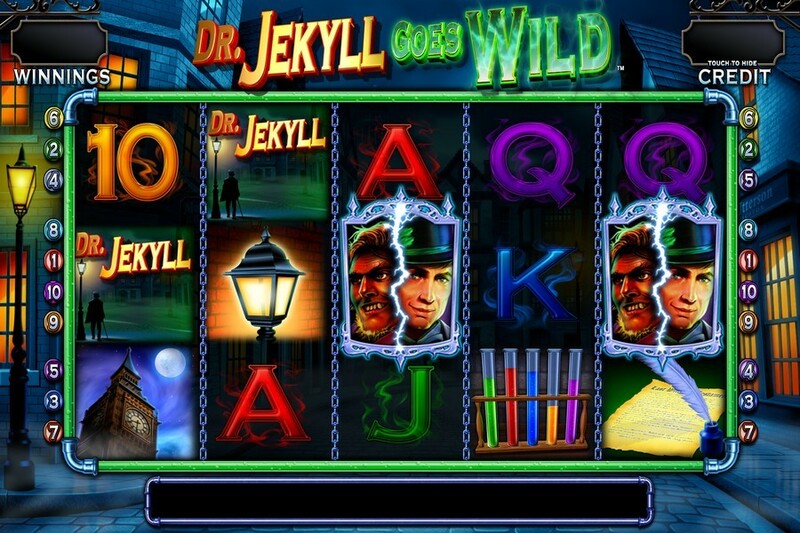 Like many games from casino software developer Barcrest, Dr Jekyll Goes Wild gives you a chance to up the stakes and play in Big Bet feature. These are a series of 5 linked spins that come with a special trail. The more scatters you land during the linked Big Bet spins, the more free spins you’ll be awarded. There are £20, £30, £40 and £50 options here. The higher the stakes, the fewer scatters you need to land the free spins. At all levels, you can win up to 75 free spins. At the max £50 Big Bet, 6 scatters will get you 75 free spins. At the £20 Big Bet level, you’ll need to land 8 to get the same result. Playing in Big Bet mode also ups the RTP rate to 98% from 94% at stakes of £2 or less per spin or 96% at £2 or more per spin. The design harkens back to dingy, Victorian-era London and is nicely done. There’s a decent range of extras available too. The sticky wilds in the Hyde Spins feature certainly spice up the bonus round. If you can afford the Big Bet modes, it’s worth giving them a go. Dr Jekyll Goes Wild is a novel take on an old favourite and worth a look if you’re after some classic chills and some interesting extras. For your reference, Playtech offers you Jekyll & Hyde which has 2 modes in the Free Games feature (Jekyll Spins or Hyde Spins).